We have a large mango tree in the garden. 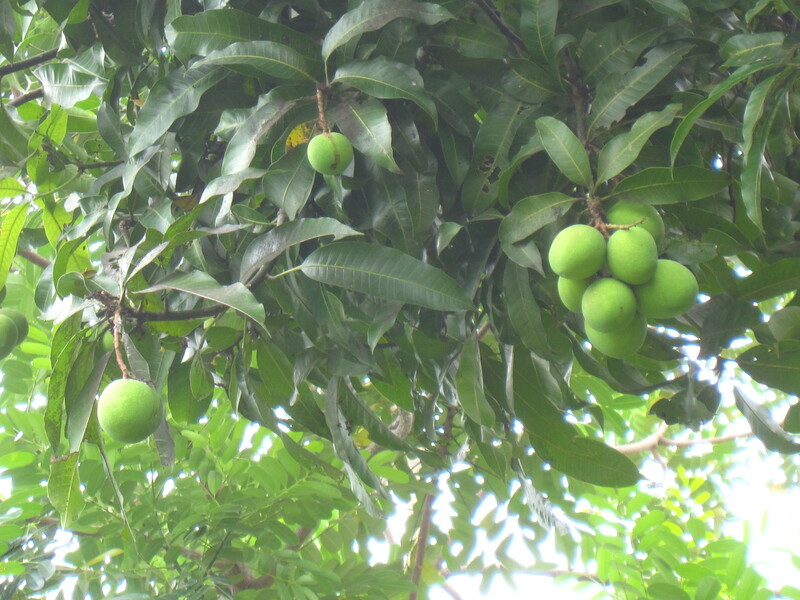 I am patiently watching the small mangoes as they grow and looking forward to them ripening. I wish they would hurry up! Mangoes are one of my favourite fruits and the thought of a mango supply at my doorstep is quite delightful, particularly as I completely missed mango season last year. Mangoes taste delicious, and feel to me like a symbol for life in this part of the world in many ways. So it feels as my mango world is being shaken a bit at the moment. I still feel a mix of emotions following the earthquake triggered disasters in Japan. It brought memories and emotions from 2004 flooding to the surface for many of us. I feel a bit unsettled with these memories. The level of preparedness in Japan demonstrates clearly how critical this is and what a difference it can make, even in the face of such unimaginable devastation. I am being shaken in another way too as we approach the next phase of my work. There are uncertainties which are difficult to live with in any situation, but when lived through the breast cancer lens become highly stressful and even frightening. I know this is a storm I have to ride, but that doesn’t mean it isn’t scary hanging on as it gathers pace. Captain Paranoia has also taken up residence, with the approach of my next set of checks. All of this has not been helped by an episode of dizziness one night. Of course that immediately convinced me that cancer beast is doing things with my brain. It is messing around psychologically for sure, but my mind was convinced that there was something sinister. This has been a one-off and I will bring my appointments forward if it happens again. I will ask Dr W2 about it when I see him. There have been a few administrative hiccups recently which again, are not huge in the big scheme of things, but which are more difficult when the overall situation is fragile. I have learned this week of uncertainties regarding my health care which is incredibly frightening. And then on Thursday evening there was another kind of shake. In fact I was sound asleep when the phone rang. I had no idea what time it was and struggled to waken enough to totter over and answer it. So I persuaded hubby J to do the honours. Being overseas, a night time call is always alarming as you always fear that it means bad news. And sure enough this was a call from home. I braced myself as I was asked “are you all right”? “We heard there was an earthquake in Myanmar”. Let me explain that I have an earthquake history. During the years I lived in Kathmandu I became increasingly concerned about the likelihood of an earthquake and a general lack of preparedness. I experienced my first earthquake in 2001 when I was in southern Nepal and the Gujurat earthquake was clearly felt. Only a few weeks later there was a shallow and very rattley 5.9 earthquake in Kathmandu late one night. I realised that I had no clue what to do and lay in my bed as I tried to decide whether to shelter under the bed, the table, run outside or any other course of action. I was still wittering and dithering when I realised that it had stopped – and I had done nothing! It galvanised me into action and I became rather vocal and active around the issue of preparedness. It made a huge difference when we were in the Big One in December 2004. I knew exactly what to do, and where to shelter even though we were in a hotel. That is a very long other story, but suffice to say that the experience and the nightmares stayed with us for a long time, and was a factor in moving house in Kathmandu and even in our eventual departure from the city. It caused great nervousness for our families and is something which has never really disappeared. I have experienced another 2 earthquakes since then, one smaller one in the Andamans ironically, the day I returned there after over 2 years later, and a bigger one when I was visiting Banda Aceh. The latter surprised me in how much it brought the fear back instantly and I started to have earthquake nightmares again. It came in the early hours of the morning and roused me from sleep by the familiar grinding noise. Before I could rationalise what was happening, I was out of bed, had my glasses on and had immediately established that I was in a safe space. When we moved to Yangon, we made a very deliberate housing choice to live in a single story building. I even have a coconut shell hanging in the bedroom. This is a simple yet effective earthquake alarm as it rattles as soon as there is any movement in the earth. So given my sensitivity to earthquakes, it came as a bit of s surprise to hear, from the UK, that there had been one while I was sleeping! I tried to gather my thoughts. I could see that there were lights outside so power had not been cut. That told me that it was unlikely that there had been a strong earthquake. I could not hear any sounds of alarm or people outside, which also told me that things in the city were calm and therefore any quake was either not severe or not nearby. I guessed that it might have been quite a distance from us. So we were able to reassure that we were absolutely fine, and quite literally in the dark regarding any details of the quake. We switched on the news but there were no reports and we eventually went back to bed wondering what was happening. In the morning I again watched the news before my sunrise swim, and again there was no mention. I looked out into the lane and my next door neighbour was, as usual, standing at her gate beside a small table with rice and food on it. A long line of monks was walking barefoot towards her, so many that I could not see the end of the line. Clearly things were fairly normal. So I headed to the pool. There were three other colleagues from my own and other agencies also in the pool and I quickly found that the earthquake was topic number 1 of conversation. I learned that the earthquake had been further north on the Laos and Thai borders and that there was little information yet due to the remoteness of the areas affected. It was a quite the most surreal briefing I have ever had! Apparently a number of colleagues and friends felt the earthquake, here in Yangon and also as far as Bangkok. However, despite my hyper sensitivity and fixation, I was completely unaware! Details are still coming in of death, injury and destruction and our community is assessing the most appropriate response. So the world around and within me is being shaken in so many different ways, and I am trying to hold on and trust that the shaking calms down and we can all move forward. Mango shake I can deal with. I am not sure if I can handle mango crumble. This is the post I wrote a year ago, and which is eerily current. “There’s one thing about cancer – my goodness it makes you self centred! Conversation and communication revolves around current treatment, side effects, what’s next, how well I’m coping (aye right!) and generously taking the p*** out of cancer as it takes the p*** out of me! It’s not that I don’t care or think about anything external but rather that the whole cancer thing just takes right over. So this is an attempt to see things a little bit “out of the box” and remember that there was a Feisty Blue Gecko before there was a need to fight back! Indeed it is not as if I was short of things to say about life before the lump. I have had a pretty amazing life in lots of ways, one of extremes and challenges and privileges and rare experience. I could really honestly say that I loved life, and in particular I loved my life. And then I found the lump. I do still love life, but it just all feels on hold. And I don’t love the chemo-treatment-bald-twang arm life in the same way!! So I have been prompted to look back over recent years. I moved to Nepal (from Scotland) in mid 2000 and ended up living and working there until late 2005. I grew and learned enormously both personally and professionally in those years, and experienced some incredible times both frighteningly challenging as well as heart-stoppingly magical. In November 2005 hubby J and I moved to Mongolia where we spent a hugely different year in a massively different context, culture and climate, never mind diet!………..More incredible learning and challenges. A year later we packed again and set off back to the sub continent – this time to the tsunami affected areas of India (Andhra Pradesh, Tamil Nadu, Pondicherry and the Andaman and Nicobar Islands) and a professional shift from broad development work into post emergency/rehabilitation and humanitarian work. It was also a very special opportunity to re-visit the Andaman Islands where we had been on December 26 2004 (and that earthquake and tsunami experience is a whole other tale, for another day…….) It was wonderful both professionally and personally, and an invaluable experience which enabled great healing. And that is when Feisty Blue Gecko was born. I started blogging following my first visit back to the Andamans, when I was treated to a small earthquake just to remind me of 2004. After our year in India I moved next door to work in Sri Lanka for another year, when the conflict was at its peak in full scale humanitarian work. It was an incredible change to begin my work in Myanmar last year and I was really settling into life and work here. I was completely and utterly unprepared for the cancer call when it came. Recently, I was kicked out of my cancer induced introversion by global events. The Haiti earthquake immediately shocked in its severity and I was surprised to be contacted with 24 hours to ascertain whether I might be available to be deployed for the emergency response. Clearly I was in no position to be any use there. However, it really made me stop and think. I could see how small and personal my own “calamity” was, yet it hammered home just how much life has changed for me. The thought that I might not be able to play a part in a humanitarian response again was particularly hard to contemplate. At the same time, a lesser known disaster was emerging in Mongolia, a Dzuud – a kind of severe winter famine. This received little attention because its toll on human life is perceived as far less. The main impact is death of significant numbers of livestock. The traditional nomadic herding communities however, experience the harsh after effects for many years to come. These include immediate and often total loss of livelihoods, migration to urban areas and many are deeply trapped in poverty. And that does not begin to describe how life is affected for the herding families and the real difficulties of such a change. While I was working in Mongolia I heard of and saw over and over again the impact of the Dzuud disasters on families which had taken place 4 – 5 years previously. Time and time again I heard of the effects on those families and how so many were still struggling so many years later. Apart from the fact that I was in the midst of active treatment when I wrote this, and Haiti was on the world stage rather than Japan, my thoughts seem to be very similar. Although I am in a much stronger position now and have indeed recently been involved in a response in country, things have shifted and changed. I am living life again, picking up the pieces and but it is most definitely through the breast cancer lens. And as much as my own world has been turned upside down since diagnosis, the magnitude of what has happened in Japan and my reactions show that despite the fact that I am in a different and better place this year, I still need to be shaken from introspection. I came home for an hour at lunchtime yesterday as I had been unwell overnight, and wanted to have a short rest. Just before I was about to leave home I switched on the TV to see what was happening in the world. With utter horror and disbelief I was confronted with live footage of the tsunami sweeping over northern Japan. I was glued to the screen, compelled to watch despite the fact that I knew that people were caught in the devastation unfolding before me. There is such a mix of emotions at a time like this. I was willing there to be less suffering than the horrific images indicate. There was shock and disbelief at the incredible destruction and fragility of life. As a humanitarian and development professional, I found myself immediately connecting into response and relief updates. I had not expected however, that I would suddenly feel as if I had been instantly transported back to December 2004. (I was in the Andaman Islands at the time of the Boxing Day earthquake and tsunami, and it was incredibly traumatic, particularly for our families). Contact with my family back in Scotland confirmed that we were all taken back to that day. Last year not long after the earthquake struck Haiti I wrote a long post for the blog, which I never actually posted. I reflected how introspective I had become due to cancer taking over my life and noted that the recent global disasters had kicked me out of that. This had been prompted by the fact that I had been contacted to see if would be available for the response. I felt that as a bald, single breasted, fully signed up member of the chemo club I would not be much assistance, so declined the invitation for deployment. I have re-read that post today as it seems particularly poignant and will revise and post in the coming few days. The words of Sting particularly strike me – both in the bigger scheme of things as well as in our own immediate worlds “lest we forget, how fragile we are”. We are indeed. I have been Missing in Action for the couple of weeks now and an update is overdue to fill in the blanks. So this short post is just to start to catch up with what has been happening recently. I had a marvellous trip to the field – it was inspiring, exhausting, humbling and motivating. I had expected it to be a Big Deal and it did not disappoint. It was a Great Step Forward indeed. I returned to Yangon in high spirits. Unfortunately, within 48 hours of my return to the big city, I was felled by a stomach bug and spent far more time than I would like in the smallest room of the house, feeling sorry for myself as well as for those near to me! This lasted beyond the usual couple of days and I was prescribed an antibiotic which made absolutely no difference. 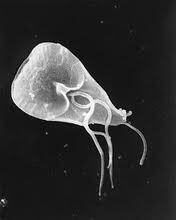 A few days later, with symptoms continuing I was treated for Giardia Lambla, a long standing acquaintance of mine. 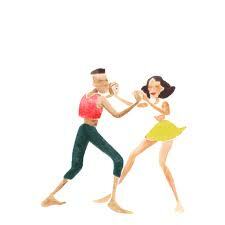 Happily this medication took effect pretty quickly and I was able take a break from dancing the Giardia Lambada! I have been living in Asia for over ten years now and over these years have spent a fair amount of time with uninvited guests and bugs resulting in a variety of gloriously crude symptoms. That’s part and parcel of living in developing contexts and demonstrates clearly the balance between the novelty and privilege of living in an exotic environment with some of the challenges. I guess you could call it a Bonus Track! In some ways, the timing of this visitation was fortunate because a close friend was due to arrive to stay with us, and I had planned a few days leave. It was frustrating not feeling well, especially since I have been full of energy recently. However, we had over 5 years to catch up on and with the temperature outside increasing every day, we spent most of the time at home. So now it is the weekend again, and I have a chance to catch up. I will be putting things together over the weekend and posting over the coming days. In the meantime, I want to share this picture of a visitor in our garden this morning! 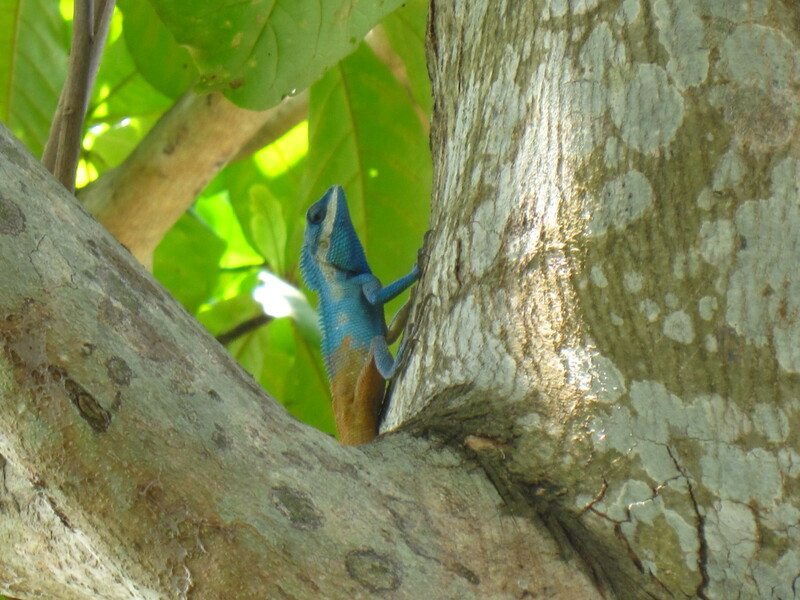 I would love to say it was a Feisty Blue Gecko, but it is apparently a Chameleon who must have been sheltering on a Flag of Scotland!